Objectives: To observe the ultra-structural changes of the brain tissue in a patient with motor neuron disease. Methods: A stereotactic brain biopsy of the local lesions was performed based on the abnormal signals on magnetic resonance images, and the brain tissues were underwent light and electronic microscopic examination. Results: Extensive extra-cellular edema and neuron necrosis were found in the internal capsule and thalamus. Metachromatic substances were found in the cyto-plasma and were characterized by electronic dense granules, arranged in flat plate layers or in flat lines. Disorganized and degenerating mitochondria were observed in astrocytes and neurons. Conclusions: Ultra-structural observation of the brain tissues might be helpful in understanding the central neuropathological changes in a patient with MND. Characteristic metachromatic substances might be found in the cyto-plasma. Neurons in the brain of a patient with MND might undergo a process of degeneration. Motor neuron disease (MND) is a progressive neurodegenerative disorder primarily involving the motor neurons in the cerebral cortex, brain stem, and spinal cord . The principle phenotypes include amyotrophic lateral sclerosis (ALS), primary lateral sclerosis (PLS), progressive muscular atrophy, progressive bulbar palsy and some special forms, such as flail arm or flail leg . The MND is not only restricted to the motor system, but is a multisystem disorder involving extra-motor cortex areas, causing cognitive dysfunction and deficits in socioemotional and sensory processing pathways . Patients with MND progressively lose their ability to control voluntary movements and occasionally enter the totally locked-in state, in which they cannot move any part of their bodies including the eyes . Previously published studies demonstrated that high signals within the corticospinal tracts and the posterior limbs of the internal capsules were found in patients with MND . 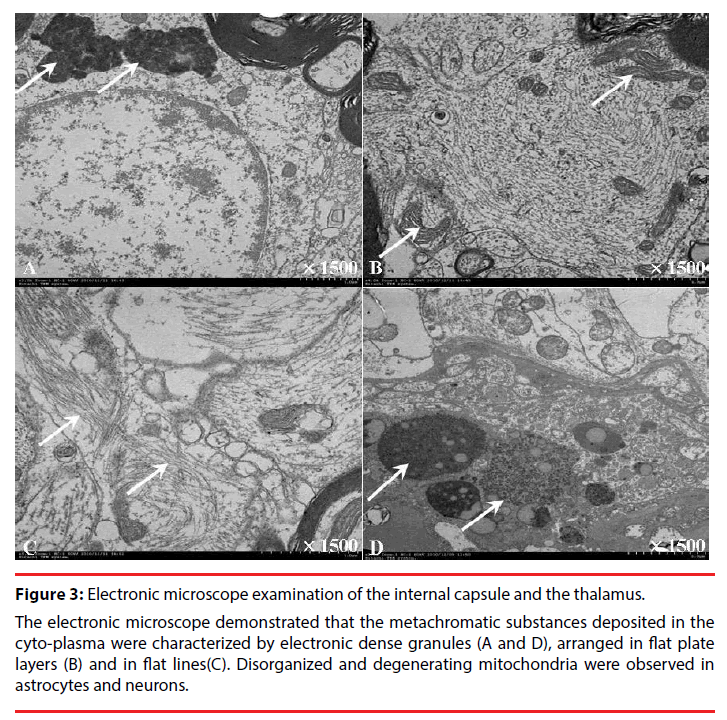 Electron microscope examination performed in ALS (the most common type of the MND) mice showed disorganized mitochondrial cristae and degenerating mitochondria in endothelial cells, astrocytes and motor neurons and extensive extracellular edema . Autopsied findings in the brain of patients with MND have been reported previously . However, brain focal biopsy findings in patients with the PLS have poorly been reported. Here, we reported ultrastructural findings in the brain of a patient with PLS who displayed high signals in the internal capsule and the corticospinal tract as well as the brain stem. A 23 years old man was admitted to the hospital due to progressively developing four limbs weakness and possible atrophy for 2 years, dysarthria, choking and shortness of breath for 1 year. He felt breathing difficult, urinary incontinence for 3 months. The patient manifested with weakness in the right low limb two years ago, walking unsteadily and falling easily. He went to hospital and received brain MRI scan and EMG as well as evoked potentials examination. The MRI found abnormalities in the ventral midbrain, bilateral peduncles, and thalamus (Figure 1-A). Abnormal motor evoked potentials were observed but no other abnormalities were found by EMG and evoked potential examination. Figure 1: Brain MRI and diffusion tensor imaging of the patient. High signals were observed in brainstem and bilateral internal capsules, the thalamus especially the right one was involved (Figure1A and B). Diffusion tensor imaging revealed that the neruofibers decreased or disrupted significantly in the internal capsules as well as in the brainstem (Figure1C and D). 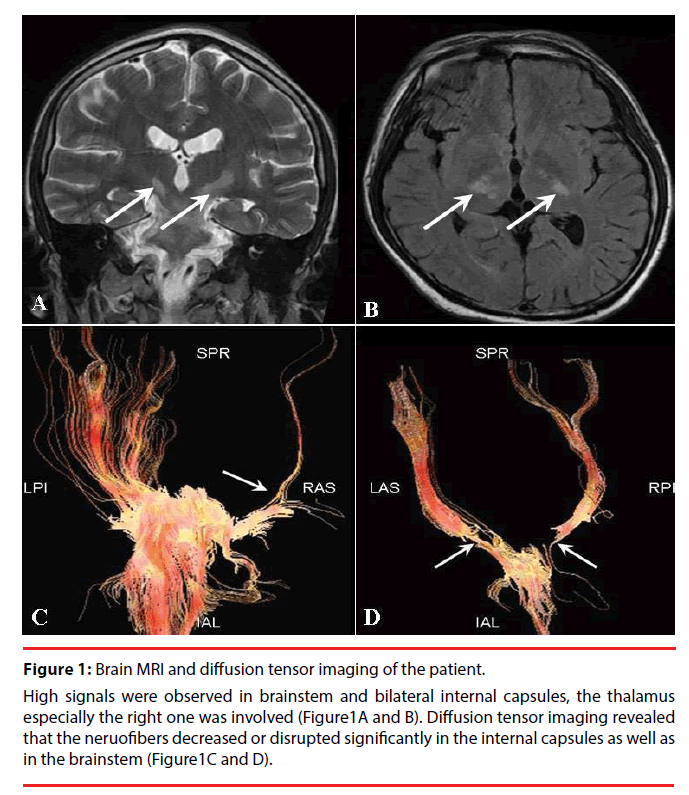 Diffusion tensor imaging observed partially disrupted fiber bundles in the left internal capsule (Figure 1-B).The clinically possible diagnosis included the mitochondrial brain disease, acute demyelinating encephalopathy and ALS. The patient hospitalized four times in one year and received nerve growth factor, immunoglobulin, steroid hormone, neural stem cells and so on for his treatment. His symptoms could get transient relief after each time of hospitalization. However, the symptoms developed progressively. The patient became paralysed and bedridden one year after the onset of the disease. He felt dysarthria, choking and shortness of breath, subsequently breathing difficult, urinary incontinence in recent 3 months. Finally, he was admitted to our affiliated hospital of Guizhou Medical University. Neurological examination found an increased muscle tone and decreased muscle strength of the four limbs, bilateral hyper-reflexia and ankle clonus as well as positive babinsky sign. Slight muscle atrophy of lower limbs was also noted. The patient had clear consciousness and showed forced laughter and crying. No somatosensory abnormalities were noted. A magnetic resonance imaging showed diffused lesion in the brain. The basal part of the pontine, bilateral peduncles, the ventral midbrain, especially the bilateral posterior limbs of the internal capsule and the thalamus were involved (Figure 1A and B). DTI showed that the fibers in the internal capsule and the brainstem are decreased significantly or interrupted completely (Figure 2C and D). EMG showed diffused neurogenic lesion of four limbs, the bilateral sternocleidomastoid muscles were involved. Abnormalities were not found in the blood routine, kidney and liver function, blood electrolyte, serum enzymology and so on. The SOD1 mutation inspection and other related gene analysis were normal. The clinical suspected diagnosis of ALS and multiple sclerosis were made, and the symptomatic treatment was performed. The legally authorized representative of the patient asked to discharge from the hospital due to lack of effective therapy. He died finally of severe pulmonary infection in his home in less than 3 years after the onset of the symptoms. Figure 2: Light microscope examination of the internal capsule and the thalamus. Extensive extra-cellular edema was observed in the internal capsule and the thalamus (A and C). Neuron necrosis and degenerations were also observed in the brain. The neurons were deformed and the Niss body disappeared. The nuclear structures of the neurons were ambiguous. Vacuoles as well as infiltrated neurogliocytes were observed in the cytoplasma (B and D). A stereotactic brain biopsy of the focal lesions was performed based on the abnormal signals on magnetic resonance images after the informed consent was obtained from his legally authorized representative. The stereotactic technique was the same as used in our previously published studies [8,9]. Briefly, the patient underwent a repeat MRI scan and was then transferred to the operating suite. The stereotactic instrument was fixed on the patient’s skull. Using the MRI scan, the puncture position was selected, and the distance from the skin level to the desired location of the puncture needle tip was determined. The coordinates of the targets in the thalamus and the internal capsule lesions were X=75mm, Y=91mm, Z=130mm and X=82mm, Y=88mm, Z=130mm, respectively. Under the guidance of the stereotactic instrument, the skull was punctured by a 3-mm-diameter needle under the driving force of an electrical drill. Then, a brain biopsy needle was inserted slightly into the targets. Subsequently, a total of two pieces of brain tissues (2×3mm) in the focal regions were removed for pathological examination. After terminating the surgical procedures, the patient was transferred to the intensive care unit. Under light microscope, significant edema and large amount of edematous vacuoles were observed in the brain tissues. The neurons were deformed and the Niss body disappeared. The nuclear structures of the neurons were ambiguous. Vacuoles as well as infiltrated neurogliocytes were observed in the cytoplasma. Electronic microscope displayed abnormal structures in the cytoplasma of the neurons (Figure 3).The metachromatic substances deposited in the cyto-plasma were characterized by electronic dense granules, arranged in flat plate layers and in flat lines. Disorganized and degenerating mitochondria were observed in astrocytes and neurons. Figure 3: Electronic microscope examination of the internal capsule and the thalamus. The electronic microscope demonstrated that the metachromatic substances deposited in the cyto-plasma were characterized by electronic dense granules (A and D), arranged in flat plate layers (B) and in flat lines(C). Disorganized and degenerating mitochondria were observed in astrocytes and neurons. This is an interesting case. The young patient predominantly manifested with motor function damages, showing progressive weakness of the four limbs and pseudobulbar paralysis. The EMG and potential displayed neurogenic damages and abnormal motor evoked potential. The MND might be the most possible diagnosis. Based on the clinical manifestations and the imaging perspective , people could think about the diagnosis of the ALS due to Cu/ Zn superoxide dismutase 1(SOD1) mutation or tau gene mutations as well as other related genes. Mutations in the Cu/Zn SOD1 account for about 20% of familial ALS cases and a small percentage of sporadic ALS cases. The previously reported cases presented with progressive weakness and muscle atrophy of the left upper and lower limbs, followed by muscle fasciculation and cramping [11,12]. However, a genetic analysis of the SOD1 gene and the related genes in our study did not show any mutations, and the patient did not have muscle fasciculation and cramping. So the possibility that the patient suffered from SOD1 mutation- ALS could be excluded. Certainly, ALS cases linked to SOD1 mutations may sometimes present with unusual clinical features such as pure lower motor neuron involvement or sensory signs . If there are other symptoms one needs to think about a number of syndromes, such as mitochondrial encephalomyopathy, multiple sclerosis, acute demyelinating encephalopathy, etc. The clinical manifestations of patients with mitochondrial encephalomyopathy are complex and various, and lack of specificity, usually presentig with symptoms of epilepsy, stroke-like episodes(hemiplegia, language disorders, and decreased visual acuity) accompanied by lactic acidosis. Routine MRI examination would be of great significance for the screening of the lesion, which has a characteristic performance and is helpful to improve the early diagnosis rate of the disease . DWI was sensitive for detecting the brain abnormalities . These features were not noted in our observation. In addition, the MRI features would lead people to consider the diagnosis of multiple sclerosis. The multiple sclerosis is a chronic demyelinating disease of the central nervous system of presumed autoimmune etiology, characterized by localized areas of inflammation, demyelination, axonal loss and gliosis in the brain and spinal cord . Patients with multiple sclerosis often present with damages to motor function and somatosensory function with two phases of remitting and relapsing. Pseudobulbar paralysises are also commonly seen. Somatosensory evoked potential, visual evoked potential are usually abnormal. MRI could detect multifocal damages in the brain and the spinal cord, especially in the white matters. Lesions on MRI are ovoid and well circumscribed with a size greater than 3 mm, show dissemination in space, and can be juxtaposed to the corpus callosum. Lesions do not follow a vascular distribution and do not account for any other pathologic processes . Patients with acute demyelinating encephalopathy present with an acute monophasic illness characterized by behavioral abnormalities, visual illusions, and a seizure, who had magnetic resonance- documented or brain biopsy-documented evidence of multifocal central nervous system demyelination as well as serological evidences [18,19]. However, the patient in our study did not show any symptoms but decreased motor function. His clinical and MRI features were not consistent with the abovementioned diseases. These diseases might be excluded in making a diagnosis. Finally, the PLS might the most possible diagnosis as the patient only presented with damages to upper motor neurons with normal blood tests, and EMG suggested neurogenic lesion of the four limbs. In the ultrastructural studies, there are membrane bound and not membrane bound accumulation of fibrillary material, as well as spheroid bodies. Mitochondria are swollen, sometimes with vacuoles inside. This demonstrates that the cells are undergoing a process of degeneration. At electron microscopy, some features may let us think about metachromatic leukodystrophy, especially the stacked myelin aggregates. In metachromatic leudodystrophy people would expect lipid filled macrophages, granular myelin debris and reactive astrocytes. As far as someone can judge from the selection of MRI picture, the signal alteration is really along the corticospinal tract, not within the white matter, as some people would expect in metachromoatic leukodystrophy. In conclusions, the present observations might be helpful in understanding the MRI and the pathological ultra-structural changes in the brain of a patient with MND. Beghi E, Logroscino G, Chio A, et al. The epidemiology of als and the role of population-based registries. Biochim. Biophys. Acta 1762(1), 1150-1157 (2006). Chio A, Calvo A, Moglia C, et al. Phenotypic heterogeneity of amyotrophic lateral sclerosis: A population based study. J. Neurol. Neurosurg. Psychiatry 82 (1), 740-746 (2011). Shen D, Cui L, Cui B, et al. A systematic review and meta-analysis of the functional mri investigation of motor neuron disease. Front. Neurol. 6 (1), 246 (2015). Fuchino Y, Nagao M, Katura T, et al. High cognitive function of an als patient in the totally locked-in state. Neurosci. Lett 435 (1), 85-89 (2008). Thorpe JW, Moseley IF, Hawkes CH, et al. Brain and spinal cord mri in motor neuron disease. J Neurol. Neurosurg. Psychiatry 61(1), 314-317 (1996). Garbuzova-Davis S, Haller E, Saporta S, et al. Ultrastructure of blood-brain barrier and blood-spinal cord barrier in sod1 mice modeling als. Brain. Res 1157(1), 126-137 (2007). Konagaya M, Sakai M, Iida M, et al. [an autopsied case of dominantly affecting upper motor neuron with atrophy of the frontal and temporal lobes--with special reference to primary lateral sclerosis]. Rinsho. Shinkeigaku 35(1), 384-390 (1995). Wu G, Wang L, Hong Z, et al. Effects of minimally invasive techniques for evacuation of hematoma in basal ganglia on cortical spinal tract from patients with spontaneous hemorrhage: Observed by diffusion tensor imaging. Neurol. Res 32(1), 1103-1109 (2010). Wu G, Wang L, Liu J, et al. Minimally invasive procedures reduced the damages to motor function in patients with thalamic hematoma: Observed by motor evoked potential and diffusion tensor imaging. J Stroke. Cerebrovasc. Dis. 22 (1), 232-240 (2013). Blumen SC, Inzelberg R, Nisipeanu P, et al. Aggressive familial als with unusual brain mri and a sod1 gene mutation. Amyotroph. Lateral. Scler 11(1), 228-231 (2010). Calvo A, Ilardi A, Moglia C, et al. An als case with a novel d90n-sod1 heterozygous missense mutation. Amyotroph. Lateral. Scler 13(1), 393-395(2012). Kim MJ, Bae JH, Kim JM, et al. Rapid progression of sporadic als in a patient carrying sod1 p.Gly13arg mutation. Exp. Neurobiol 25(1), 347-350 (2016). Shi YH, Zhao JH, Song JL, et al. [analysis on clinical features and functional mri of mitochondrial encephalomyopathy with lactic acidosis and stroke-like episodes]. Zhonghua. Yi. Xue. Za. Zhi 96(1), 2969-2972 (2016). Abe K, Yoshimura H, Tanaka H, et al. Comparison of conventional and diffusion-weighted mri and proton mr spectroscopy in patients with mitochondrial encephalomyopathy, lactic acidosis, and stroke-like events. Neuroradiology 46(1), 113-117 (2004). Milo R, Miller A. Revised diagnostic criteria of multiple sclerosis. Autoimmun. Rev 13(1), 518-524 (2014). Kaunzner UW, Gauthier SA. Mri in the assessment and monitoring of multiple sclerosis: An update on best practice. Ther. Adv. Neurol. Disord 10(1), 247-261 (2017). Paskavitz JF, Anderson CA, Filley CM, et al. Acute arcuate fiber demyelinating encephalopathy following epstein-barr virus infection. Ann. Neurol 38(1), 127-131 (1995). 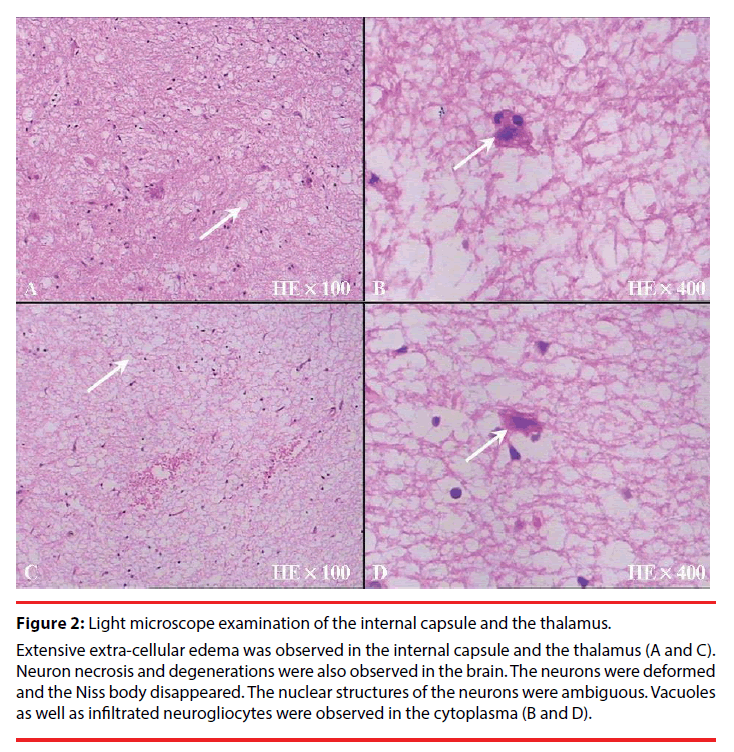 Friedman M. Acute diffuse demyelinating encephalopathy: Report of two cases. Am. J. Pathol 21(1) 519-526 (1945).